Entering Perth at half 6 on a Sunday morning, through their central business district (CBD) was a surreal introduction to Australia. There was not a person to be seen. After over 24 hours or travelling it was hard to remember that it was actually that early but one thing that has remained a surprise to me is the lack of people considering it is a major city. I am not saying it remained as quiet at that early morning walk through town but, considering this is the capital of Western Australia, it doesn’t seem as busy as you’d expect. That’s not to say that’s a particular bad thing. Perth is a very nice city. There seems to have been a very conscious effort to make this city very pretty. Art is obviously very important in this city – there are a number of sculptures and artwork on buildings as well as colourful steps and seating areas. As Australia does get very hot, their open spaces are plentiful and beautifully landscaped – even in the windy conditions we have experienced while in Perth (we haven’t had the blistering heat you would expect in Australia – yet) it is hard to not sit out in a park or along the docks at every opportunity. We spent our first day, albeit very jet lagged and tired, wandering the city and ended up relaxing on Elizabeth Quay which looks out onto the river in one direction and has the impressive CBD skyline in the other. Sitting there, it’s easy to picture businessmen and women coming down to the Quay on their lunch break or after work for a few drinks in the sun – doesn’t sound too bad to me, there could be worse places to work! Getting around Perth is very easy, they have free buses known as CAT buses with around 4 different routes so can be used to explore all of the city without paying a cent. We have been using them extensively, it can be a nice way to see bits of Perth you may never get to see without exhausting yourself from walking all day and can make getting to the edges of the city a bit quicker. Saying that we have still walked A LOT – but that’s always the case when exploring a city I guess. 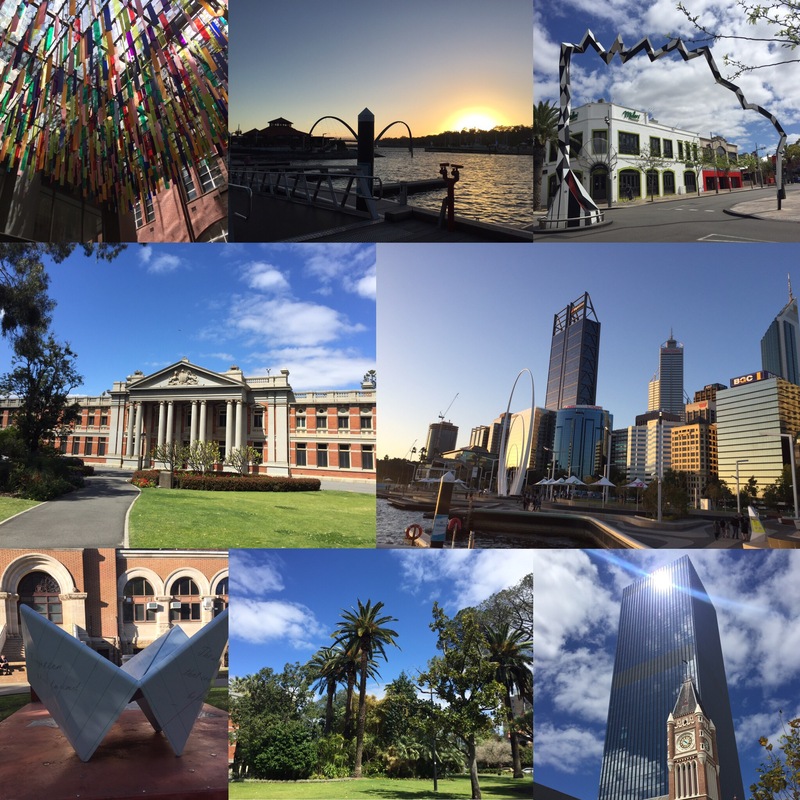 Our first impressions of Perth were positive and we were looking forward to exploring some more. As we are in Australia, when we got a tip about a place to see kangaroos, we jumped (no pun intended) at the chance. Heirisson Island – get it on the list if you’re in Perth! We got the free bus there and then walked around the island. We didn’t see any kangaroos – we kind of pictured it to be like seeing deer in the UK so couldn’t believe it when we had circled the island twice and not seen a thing. We were about to give up – causing the rest of the day to be filled with disappointment – when suddenly Niall spotted one in the bushes. Turns out we seemed to have picked the exact time of day that kangaroos have their nap to go to see them! We were going to keep our distance seeing as kangaroos are pretty strong and we didn’t fancy getting attacked on our second day there! But another girl approached the kangaroos and stroked them so we did too. We must have spent an hour with the kangaroos – one even let us get a selfie with it* – before we left them to sunbathe for the rest of the evening. We even caught a bit of the sun ourselves but nothing like the sun we are promised to get once summer kicks in! Cottesloe Beach was the next stop in our travels. Just like everywhere we had been in Perth, it was pretty windy. We sunbathed for a bit and were going to go in the sea but then the shark siren went off. I don’t know if you’ve ever seen it in videos on YouTube but its a really loud siren that goes off down the whole beach and that is everyone’s cue to get out of the water because it means a shark has been sighted or they know of one in the area – we never saw it. Needless to say we decided not to go swimming. It was still a good day though and nice to see Australia’s beached for the first time. One of Perth’s main attractions is King’s Park. This is considered one of the best parks in the world and it is huge. Getting to King’s Park is a bit of a trek because it is pretty high up. We had to walk up a huge hill – loads of people use that hill for exercise (not something I would ever do!) – and the signs took us a bit of a strange way. It is so worth it when you get to the top though! The park has views of all of Perth that are pretty spectacular! We spent the day there walking around and resting (we were pretty tired after a trip to Rockingham – post of that coming soon) so it was nice to relax. King’s Park has a large botanical garden which is pretty and gives an idea of all of the types of environments in Western Australia. It’s definitely somewhere to spend some time if you come to Perth. One of the things that has struck me the most about Australia so far is how friendly everyone is. We have received nothing but kindness and help from everyone we have met and it has made us feel very welcome and, seeing as we’re from Newcastle, a bit more at home. I’ll be posting some more about what we have been up to in the areas surrounding Perth soon to let you know what else we have been filling our time with – we have been busy!